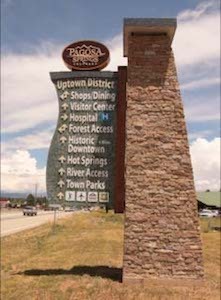 The first thing you notice when arriving in downtown Pagosa Springs, Colorado, is the smell. It’s the faint essence of rotten eggs, but the fumes are the by-product of one of Pagosa Springs’ chief assets, the world’s deepest volcanic hot springs, and people flock to the springs year-round to sit in the pools of steaming hot mineral-laced waters, soaking in the healthy and inviting warmth the earth offers. Almost magically you’ll be like one of the locals who doesn’t even notice the scent. The springs have a long and complicated history. The “breath of the earth,” as Native Americans once thought of them, have been here for millennia and their curative powers are said by some to heal almost any malady. The sacred springs were so important to the Native Americans that battles between two competing tribes, the Southern Ute Indians and the Navajos, ended in an historic duel between American Army Colonel Albert Pfeiffer and a Navajo warrior to determine the ownership of the “pagosa” (healing waters) once and for all. The Navajo brave lost that fight, and since that time in the 1870s Pagosa Springs has changed from a Cavalry outpost (Fort Lewis) to a logging center and ranching community, and now it is a tourism destination where healing arts like massage and aromatherapy flourish, complementing the relaxing nature of the hot springs. Pagosa Springs isn’t just one more stop along an endless strand of four-lane blacktop — you have to want to be there. If you’re not flying in on your personal jet to Pagosa Springs’ Stevens Air Field, you’re driving to town on U.S. Highway 160, possibly over 10,000-foot-plus Wolf Creek Pass, or north on U.S. Highway 84 from New Mexico. There are no commercial flights to Pagosa Springs. La Plata County Airport, about 60 miles west of Pagosa Springs near Durango, Colorado, is the closest commercial airport. There are no trains or buses transiting Archuleta County. No sir, if you’re journeying to Pagosa Springs, you are driving, but if all it took to get to Shangri La was a 50-cent crosstown bus ride, Shangri La wouldn’t be Shangri La. Today Pagosa Springs draws visitors from around the world, but the nurturing hot springs aren’t the town’s only attraction. Nestled in the South San Juan Mountains travelers to this small mountain town can poke around inviting local shops, art galleries, and antique shops tucked along downtown streets. 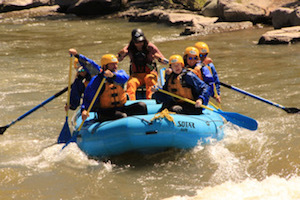 During the summer kids scurry from one end of Pagosa Springs to the other, plopping their inner tubes in the waters of the San Juan River and floating through the heart of town. This ritual is repeated hundreds of times each day. Diners relax on shade-covered patios or in dining gardens, experiencing delicious local fare; beer aficionados quaff icy cold local brews paired with enticing and plentiful pub food. Sportsmen visiting southwest Colorado find unparalleled horseback riding and mountain pack trips or hair-raising whitewater rafting. 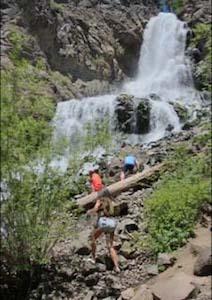 Fishermen patiently wade through secluded fishing holes on the San Juan River ready to outsmart cutthroat and brown trout, while hikers traverse endless trails throughout the San Juan Mountains and bicyclists pedal miles of forested byways and roads all around the area. In the fall and spring hunters from around the country descend on Pagosa Springs, and why not? With deer, elk, bear, and turkey seasons for bow, black powder, and rifle hunting, the area is a hunter’s paradise. And there’s plenty to do for those who elect to forego the hunting experience in favor of good food, a hot shower, and a warm, comfortable bed. In the winter it’s skiing that brings people to Pagosa Springs. The legendary Wolf Creek Ski Area is often the earliest skiing and snowboarding area in the U.S. to open. (Remember the ’70s song “Wolf Creek Pass” by country singer C. W. McCall? Well, that’s just where the ski area is.) It is arguably the best powder snow in Colorado. Likewise, Nordic skiing is breathtakingly beautiful on groomed trails through pristine, snowy, backcountry woods. And remember those hot springs? They’re just as toasty and inviting in the winter, the perfect tonic after a day on skis. There is no dearth of sightseeing opportunities. Locally or within easy driving distance there is hot air ballooning, the Rio Grande and Silverton Railroad just 60 miles to the west, a thrilling drive on the Million Dollar Highway to Silverton, guided adventure tours to ghost towns like Summitville, or a visit to the Southern Ute Indian Reservation and the impressive Sky Ute Casino. 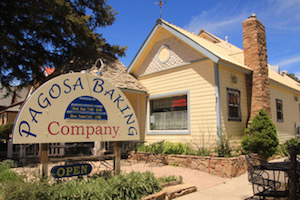 Unspoiled and authentically refreshing Pagosa Springs, Colorado, is truly a visitor’s paradise for all seasons.